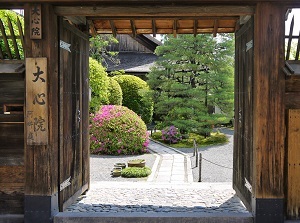 Myoshinji is a temple of Rinzai Zen Buddhism, one of the three Japanese Zen sects. 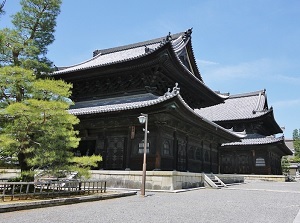 It is located about 1.5 km south of Ryoanji temple. 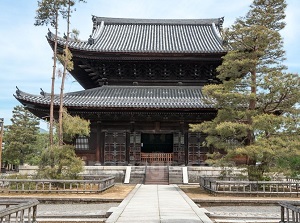 Myoshinji is the central temple of Myoshinji school in Rinzai Zen Buddhism. Originally, here was the villa of Emperor Hanazono (1297-1348). Then he became a priest in 1335, and he changed the villa to a Zen temple. The temple was destroyed by fire in 1467 by the civil war, but it was rebuilt, soon after that. And it had developed since that, with the support of the power. This temple has a large site. It is about 700 meters long from north to south and about 500 meters wide from east to west. 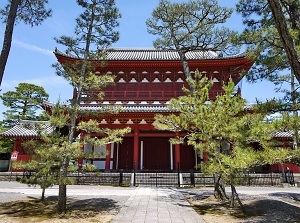 And there are the buildings of Myoshinji in the center of the site, and there are 40 temples built by the disciples of the high priests around Myoshinji. The site is like a temple town. 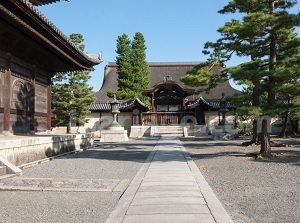 Out of the site, there are such several temples, and Ryoanji is also a temple of them. 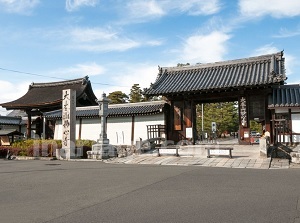 Myoshinji has Chokushimon gate (built in 1610), Sanmon gate (built in 1599), Butsuden temple (built in 1827), Hattou hall (built in 1656) and some other buildings. Hattou has the ceiling with the paintings named "Unryuzu" and a temple bell designated as a national treasure. Unryuzu was drawn by Tan'yu Kano (1602-1674), an outstanding Japanese painter at the time, for eight years, and is one of his best works. 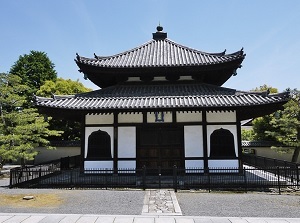 The temple bell is the Japan's oldest one with inscribed creation date. The year is 698. We can visit only three temples of 40 other ones around Myoshinji. They are Taizou-in, Daishin-in and Keishun-in. 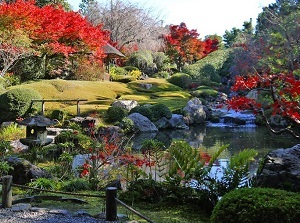 They have beautiful Japanese gardens. By Randen (Kitano Line of Keifuku Electric Railroad), about 4 minutes from Kitano-Hakubaicho to Myoshinji. Then about 8 minutes walk from there.